You are here: Home » Life Issues & Bioethics » Contraception & Abortion » Has Abortion Lived Up to It’s Promises? 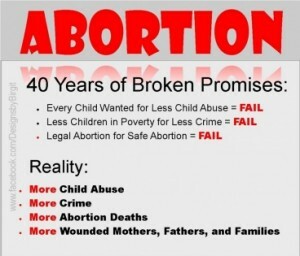 Has Abortion Lived Up to It’s Promises? As a recent article in Time magazine pointed out, ultrasound technology and medical advances have steadily chipped away at the public’s support of abortion, because the humanity of the unborn child has become increasingly undeniable. And while that’s good news, there’s still a barrier pro-life advocates haven’t seemed able to overcome, a reason people cite for keeping abortion legal that for many, trumps even the moral responsibility to protect innocent human life. And that’s the belief that abortion offers a pragmatic solution to our worst societal scourges. Abortion may be evil, admit the honest pro-choicers, but it’s a necessary evil. We need it if we’re to keep other serious problems in check. Even before Roe v. Wade, abortion advocates have insisted that widespread access to abortion will mean “every child a wanted child,” which will reduce child abuse. Abortion will reduce crime, too, since those unwanted and impoverished children who often grow into criminals will never be born. It will also protect vulnerable women from being butchered by untrained abortionists cashing in on their desperation. Widespread abortion, we were promised, would lead to stronger women, stronger families, and a stronger society. With nearly 50 million “unwanted” children eliminated via abortion since 1973, we should have seen child abuse plummet. But that’s not what has happened. In 2005, nearly a million children were victims of abuse and neglect, with experts estimating that three times that amount were actually abused. Almost 1,500 children died of their injuries that year, according to the U.S. Department of Health and Human Services, which reports that all types of child abuse have increased since 1980. For some reason, the plan to reduce crime by eliminating the potential victims just didn’t pan out. Nor have we seen any positive impact on crime in general because of abortion. Interestingly, “progressive” states that legalized abortion prior to Roe v. Wade experienced consistently higher homicide rates nearly every year between 1976 and 1998, according to Yale University law professor John Lott and Australian economist John Whitley. Lott and Whitney found that legalizing abortion actually increased state murder rates by up to 7 percent. It seems that the plan to reduce crime by eliminating the potential perpetrators floundered, too. And what about the women whose lives would be dramatically improved by abortion? How have they fared? Contrary to the claims that thousands of women were dying from illegal abortion prior to Roe v. Wade, the American Medical Association reports that the figure for 1950 was actually 263, and that those numbers were even dropping, with 119 abortion-related deaths in 1970. Regardless, legal abortion was supposed to virtually eliminate the chance that a woman would be injured or killed during an abortion. It’s clear legalizing abortion has actually increased the risk to women’s health. As Gosnell discovered, even the most incompetent abortionist can count on abortion advocates to cover up the carnage they visit on unsuspecting women, who have been assured that abortion is safe because it’s legal. Case in point: former pro-choice governor of Pennsylvania, Tom Ridge (R), ended regular inspections of abortion clinics in that state during his administration. Which meant that for nearly two decades, Gosnell’s house of horrors was allowed to operate unchecked, with warnings from patients, doctors, and public health employees repeatedly ignored. Not that Pennsylvania is unique; many (most?) states have turned a blind eye to the abortion industry in the interest of protecting abortion access at all costs. My home state, Virginia, just passed legislation a few years ago finally requiring abortion clinics to meet the same medical standards as other free-standing clinics. In any other area of medicine, this lack of government oversight would instantly be considered unsafe and unacceptable, yet we’re willing to expose women seeking abortions to this kind of substandard medical care. Abortion advocates need to just say what they really mean: safe if possible, but legal regardless. Not surprisingly, then, “complications following abortions performed in free-standing clinics is one of the most frequent gynecologic emergencies…encountered,” according to an article in the Journal of the American Medical Association in February 1983. Twenty years later, nothing has improved, as the 2005 WHO report showed. Few people realize that even in the United States, legal abortion is actually the fifth leading cause of death for pregnant women. Far from protecting women, legal abortion is instead maiming and killing us–with impunity. But abortion gives women control over their fertility and that’s empowering, abortion advocates insist. Yet for a choice that’s supposed to be so beneficial, it’s strange so many post-abortive women find the experience anything but positive. Countless studies show that women who abort have an increased incidence of depression, anxiety, and suicide. They’re at a greater risk for substance abuse, and often engage in years of uncharacteristically self-destructive behavior after their abortions. Many of these women, who were once pro-choice, are now speaking out against abortion. It seems that this “empowering” experience really leaves the vast majority of women feeling powerless, abandoned, and violated. For 40 years, we’ve been told keeping abortion legal is both the practical and the compassionate choice for America. We were promised it would reduce problems such as child abuse and crime, that it would empower women and keep them safe from unscrupulous and greedy medical butchers. Abortion must remain legal, we’ve been told, because there are just so many practical benefits to be gained. Yet as the evidence clearly shows, abortion’s promises are as empty today as they were before Roe v. Wade. The practical, personal, and societal benefits of legal abortion never have and never will materialize, because a poisonous tree can’t bear good fruit. The social experiment called “legal abortion” is an abysmal failure. Let’s pray, sisters, that it doesn’t take our nation another four decades to rectify this costly mistake.